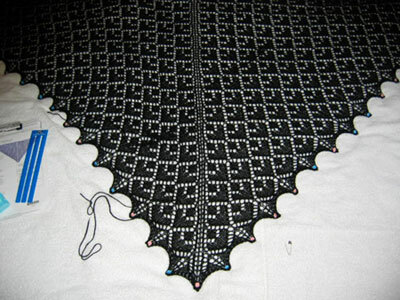 I had a good sleep last night, despite staying up ’til 2am to cast off mom’s shawl. Mom – it’s finished, and it’s drying right now. And holy cow, is it ever big. 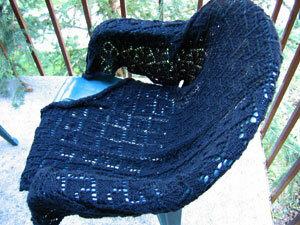 I used my new Knitpicks Options needles – the 60 inch ones, since this is a big shawl. And the cable popped right out of its socket. The socket screw is still firmly attached to the needle, though. It was a moment of true panic, folks…a shawl that’s easily four hundred stitches strong, in the second to last row…and the needle breaks. And about fifty stitches go sliding off into the ether. I’m sure you can imagine the things I said about that. I whipped off about a month’s worth of dental floss and got to work, picking up stitches. Then I grabbed my double pointed needles (I brought some along for the trip…you never know) and got the stitches onto them, with point protectors to keep those from sliding off. 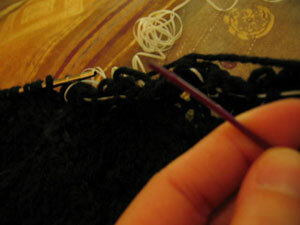 I emailed Knitpicks today – complete with picture – so we’ll see what they have to say about the needle failure. This morning, I washed the shawl. It took itself out to the balcony for a rest. After all, it had a rough night. I snitched a couple of extra bath towels from the housekeeping cart for the blocking. I’m praying that the housekeeping dude doesn’t knock on the door and discover that I have four bath towels spread out over my gigantor king-sized bed. How do you explain the need to pin and block a shawl to a housekeeping dude? I mean, I’m sure he sees some pretty strange stuff. But has he ever seen a knitter on vacation? 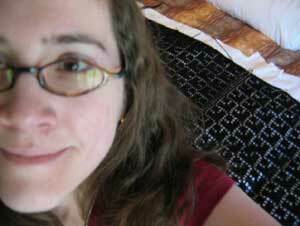 What would he say about the shawl, stretched and pinned within an inch of its life on my gigantor bed? Do you remember that scene in Jaws – the one where Chief Brody finally sees the shark, turns and says you’re going to need a bigger boat? Do you remember that? That’s what I felt when I started pinning. But I pinned and pinned, and now I truly understand the value in those weird blocking pins. I need more of those weird blocking pins. Lots more. 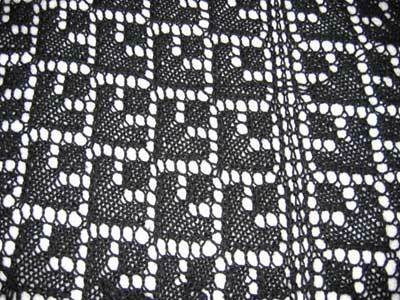 The pattern is, of course, the Adamas Shawl…my tried and true, most favourite shawl pattern in the world. Mim, I love you. You’re brilliant. I love your shawl pattern. Your shawl pattern is brilliant. I used eight or eleven balls of yarn. I really can’t remember. When I get home, I’ll count up my yarn and see what’s left. It’s Sandnesgarn Smart – 100% superwash wool, sport weight. Yep. Sport weight. Mom wanted a substantial shawl. I had my doubts in the beginning, but after pinning it out, I’ve come to see that it’s a pretty nice weight. It’s one of those shawls you’d wrap around your shoulders before heading out for a revolution or something. Or if there was some catastrophic freezing of the world – like in that movie where global warming freezes all of Canada in twenty minutes – you’d be pretty cozy for a long, long time. It’s a good shawl. It’s a hefty shawl. It’s a shawl that isn’t afraid to say what it means and use bad words if it wants to. Things learned? Always have dental floss close at hand…and those Chibi curved needles. A shawl this large should probably be spread out over three or four needle cables. 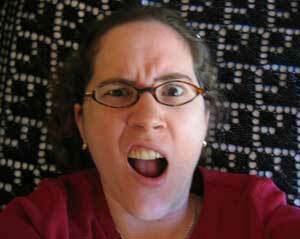 And finally…the best place to block a shawl is on a gigantor hotel bed, with extra bath towels. No cats, lots of room, and I don’t have to wash the towels when I’m done. How great is that? Look, Mom! It’s done! It’s finally done!